Instance of SCP-3535 found in nature. Special Containment Procedures: Foundation engineers have constructed an enclosed greenhouse using a closed-loop hydroponics system. Any fluids or minerals inserted or removed from the SCP-3535 containment area are to be thoroughly examined for signs of plant matter. Recovered seeds are to be destroyed as soon as they are found. Living instances of SCP-3535 are stored within Site-103. Specimens of SCP-3535 still present in the wild are to be recovered alive, when possible. If relocation is not possible due to external factors or the anomaly itself, anti-arboreal chemical agents may be requisitioned from Site-77. Description: SCP-3535 is a parasitic species of plant which expresses multiple anomalous traits and properties. Due to its reproductive method of seeding inside of native plant species and assimilating their biology, instances of SCP-3535 can be found in any climate or location. Assimilation occurs over a period of three weeks from germination until the SCP-3535 instance is considered fully matured. The functions of the host will be taken over by SCP-3535 until it dies. SCP-3535 will shed the dead weight while beginning the process of regrowing the lost mass. Other than reproducing the natural appearance of a native species, instances of SCP-3535 may also take on artificial aesthetic adjustments to blend in to urban environments, such as holiday decorations or in one case integrating itself with a cell-phone tower disguised as a tree. The bark of SCP-3535 appears to be able to adjust its coloration at any time. It also produces a disproportionately large cloud of particulate plant matter if impacting a solid surface. Sap produced does not appear to have any biological function, but acts as a powerful adhesive when contacting biological matter. Branches can also explosively detach themselves at any time, although it appears SCP-3535 primarily does this as a last-resort defense mechanism. Foliage of plants affected by SCP-3535 also exhibits multiple anomalous properties. If a leaf taken from one is placed on a black and white document, the text covered by the leaf will be reproduced on its surface. Dried leaves are abnormally sharp and if able to break the skin of a mammalian subject, a biological compound will be deposited in their bloodstream. It appears that this gives the SCP-3535 instance some intuition on the subject's location and activities, although this effect requires further research. The root system of SCP-3535 grows extensively and continually beyond the actual biological needs of the instance. They will be partially hollowed once SCP-3535 is fully matured. Root knees will grow both at the base of the tree and at the edge of SCP-3535's root system. This makes it possible for subjects at a distance to listen to conversations being held in SCP-3535's vicinity. Animals or other creatures living within SCP-3535 have an abnormal propensity to construct their nesting out of documents and other information-containing materials from their local area. This occurs most frequently when SCP-3535 has grown to full maturation in a densely urban area. History: Discovered in Washington D.C, USA after Unusual Incidents Unit agents cleaning out a deceased former agent's home reported its properties. Foundation agents were able to recover all known seeds and instances of SCP-3535 by 1999. Further operations culled the natural population of SCP-3535. It is currently estimated that between 100-200 instances of SCP-3535 may exist in the wild. 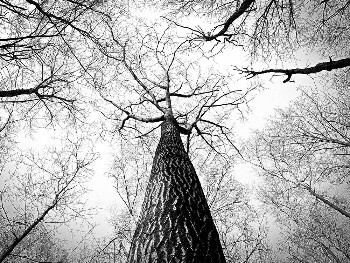 On 09/18/2008, Researcher Alleyn discovered that several trees on the grounds of Site-103 had been converted into instances of SCP-3535. Further investigation showed that the hydroponics system which had been used to maintain the population of SCP-3535 in containment had been compromised and was being used to funnel seeds through Site-103's plumbing and from there exit containment and continue propagating in the wild. Review of surveillance footage shows that all key personnel involved with monitoring and maintaining the plumbing system and SCP-3535 had unknowingly been affected by its leaves. Further research is being conducted as to whether this affected their ability to perform their duties. A purge of Site-103's plumbing revealed several dozen SCP-3535 seeds. All saplings and matured instances discovered outside of containment have been culled, with containment procedures being reviewed and updated. Testing of SCP-3535's hypothetical intelligence has been scheduled.